Well, it’s been a hot minute. Or four years worth of minutes. 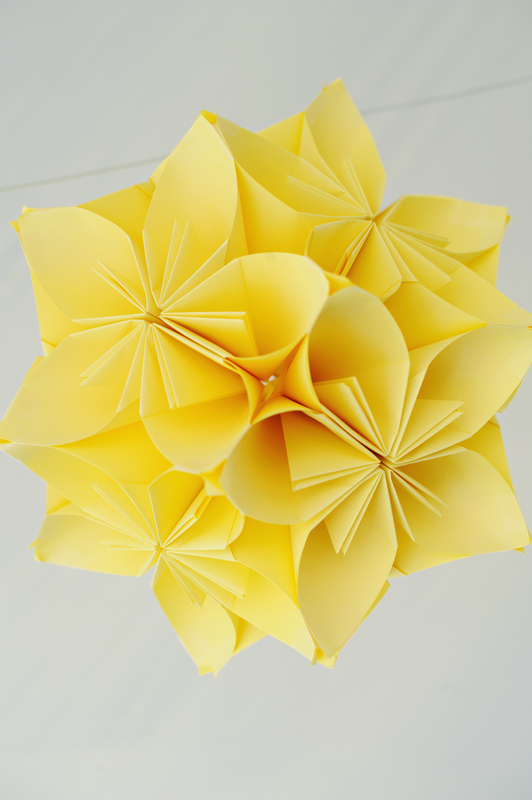 In June 2014, I took a step back from my little blog for three major reasons. 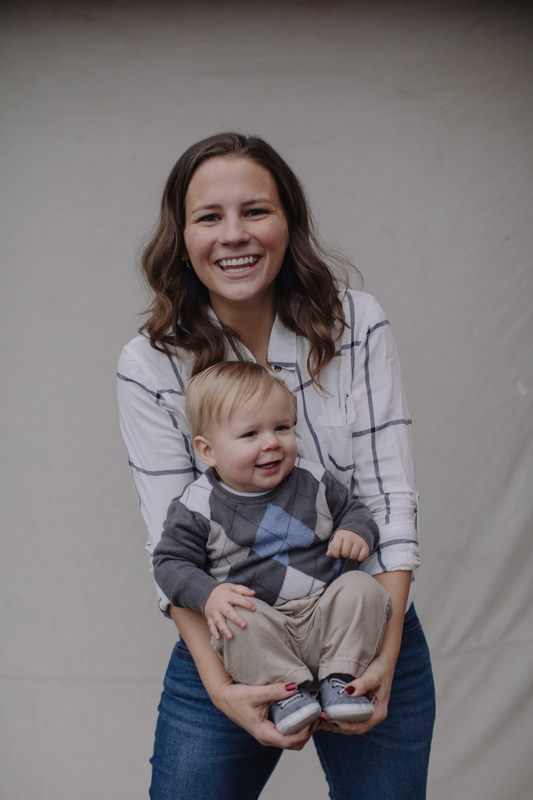 First, it takes a lot of time to maintain a blog and I was in a crazy busy season where I was working full time while my husband was in school full time and blogging was just too much to throw into the mix. Second, I felt a little uninspired. I couldn’t channel all the ideas swirling in my head into a cohesive vision for what my blog should be. My posts started to feel random, I never really had a plan for what was next, and it just felt chaotic (exactly the opposite of what I was going for). The last reason I decided to stop was because I felt a little uneasy with drawing a line for how much to share. Our world is becoming SO interconnected through technology and I felt like many of the bloggers I followed were sharing details of their family and lives and I wasn’t comfortable doing the same. So without really intending to, I just stopped. I didn’t realize my anniversary post would be “it” for the blog. It was summer and we took a vacation and upon returning … the blog just fell by the wayside. I kept up my Instagram account for a few more months but that gradually faded out too. April 2015 came around and I got an email that it was time to renew my domain name. I wasn’t sure yet what I wanted to do with the blog so I just paid the fee and didn’t think about it for the rest of the year. This happened again in 2016. And 2017. And each year, I thought “you know, I’m not touching that blog anymore – why am I paying this fee? I should just give it up.” But each time, something held me back from totally letting go and I kept on paying the domain fee. Not only that, but the word “simplify” has become a bit of a mantra for me and has stuck around all these years (it was even the word I chose to practice when I took a calligraphy class a few months ago). This April, that email came again and I finally spent some real time analyzing why I kept paying for something I wasn’t ever using. I told myself I needed to start seriously considering why I couldn’t seem to let this go and promised myself that by 2019 I would either be blogging again or would stop paying for the domain. I was listening to a podcast one day (Happier with Gretchen Rubin) and it suggested a “happiness hack” of thinking back to what you enjoyed doing when you were 10 years old. The argument was that you would probably still enjoy that activity now. I thought back and two things burst into my mind: reading and writing. I loved both so much when I was 10 years old. And I realized that I still read a ton today, but I don’t write. And a little niggling thought came into my mind: this is what your blog is for. I have spent a lot of time over the past few months dedicating real thought to what I want for this space. I feel like this time around, I know what I’m getting into a little better and have a better plan for time management and vision. My life has changed significantly since my last post four-plus years ago and therefore this blog will look different. The month of September will have a lot of “catch-up” posts to bring you up to speed with my life but once we’re caught up, I will proceed with two blog posts a week (Tuesday/Thursday) and I plan to keep certain aspects of my family’s life private (such as full names and the specific town we live in). I’m very excited and I hope you’ll stick around for the ride! I’m smack dab in the middle of the first week of standardized testing (yay . . . not) so the past few weeks at school have been crazy with reviews/test preparation. 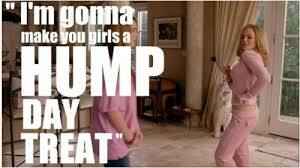 Just need to push through SIXTEEN more days at school and I’ll be on summer vacation! 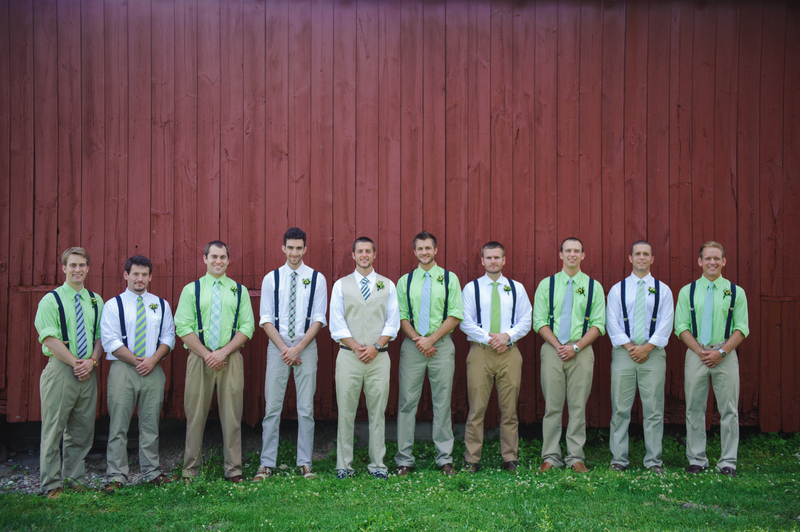 Now, on to my weekly wedding post! I should start by saying I know absolutely nothing about flowers. I went into my first meeting with my florist equipped with some pictures from Pinterest and not much else. I couldn’t pinpoint a “vision” and I was thrilled when the florist looked at my pictures, listened to what I liked about each floral arrangement, and put together fabulous ideas for me! 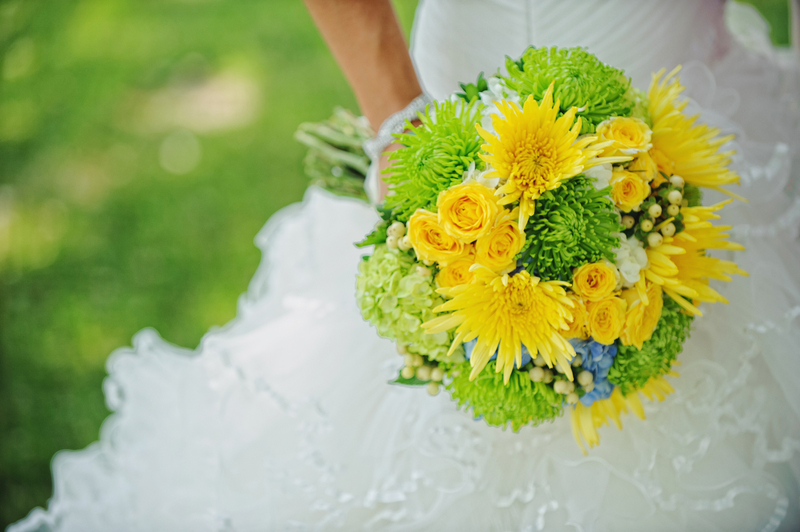 Basically, my vision for the florist was “yellow and green flowers that are super fun.” Needless to say I think she nailed it! And I love the surprise pop of blue! 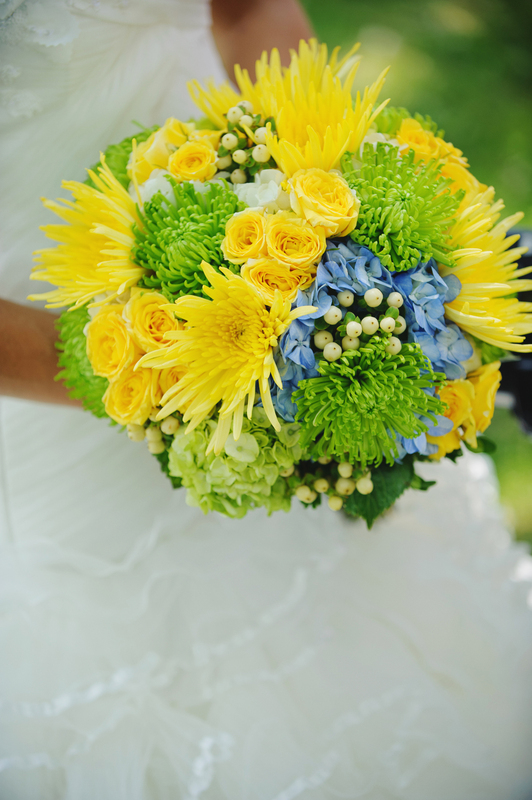 My bouquet was made up of hydrangeas (my fav flower! ), chrysanthemum fujis, spray roses, and hypericum berries. Probably some other stuff too but I can’t remember anymore. I loved how colorful and fun it was! 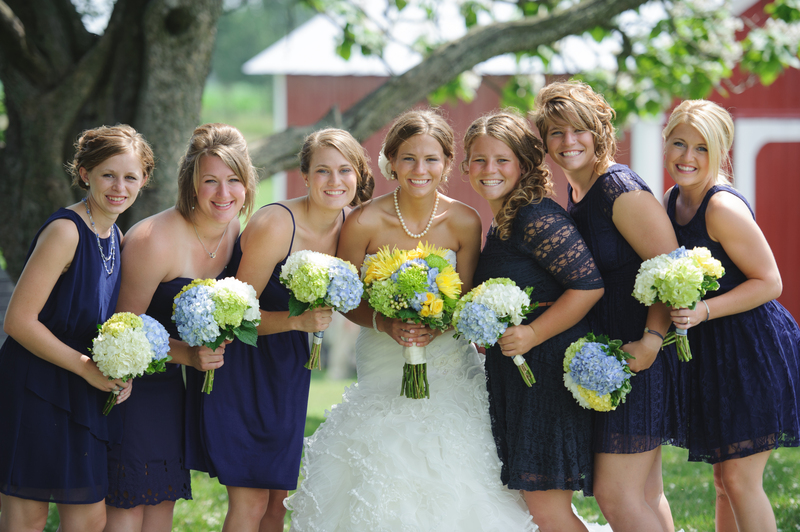 My bridesmaids had bouquets made up of different colors of hydrangeas. 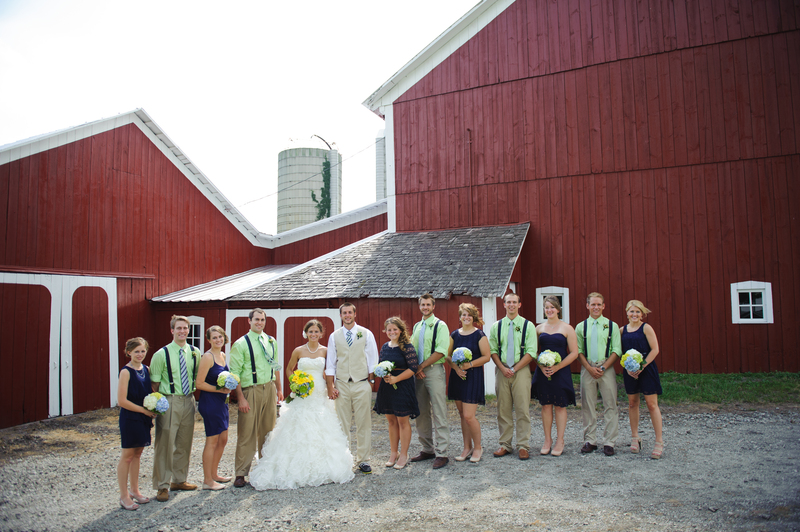 They had blue, yellow, green, and white — they all looked perfect! 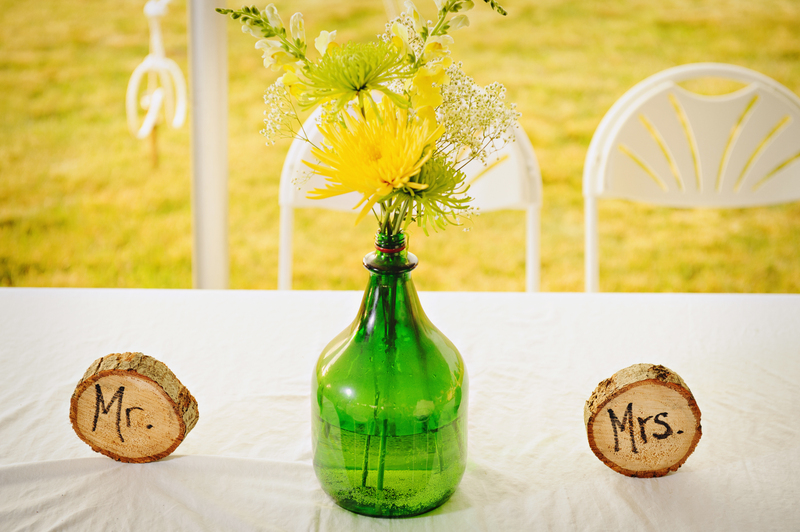 As I wrote in a previous post, a huge part of our decorations were wine bottles. I bought various flowers from my florist in bulk and stuck them in the wine bottles. Voila! Super easy and way cheaper than paying for a huge arrangement. 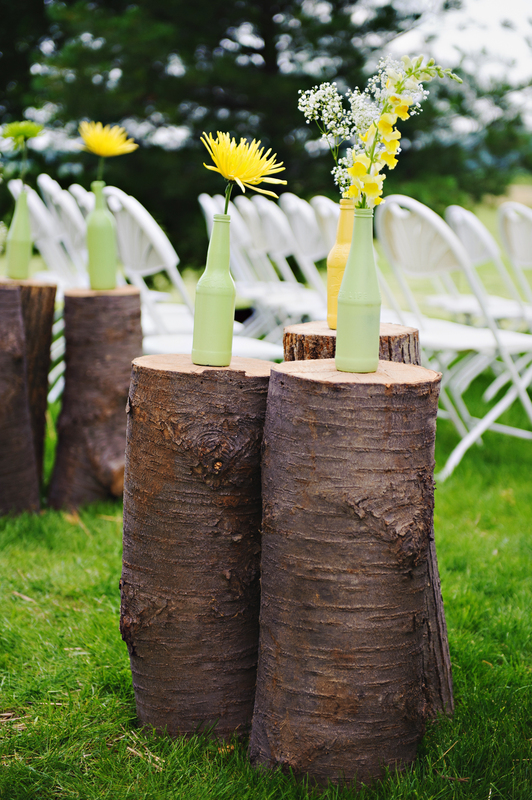 We did this on the stumps lining our aisles and in our centerpieces. I think it really tied everything together! 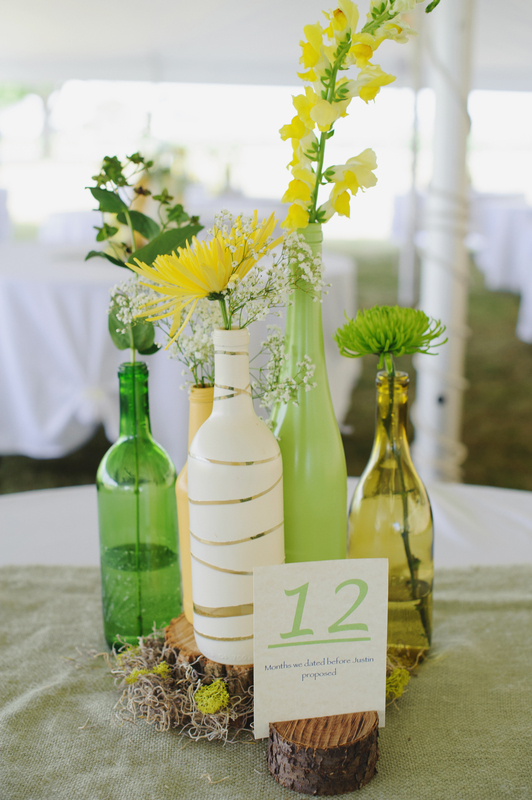 In addition to spider fujis to match my bouquet, we used snapdragons and baby’s breath (plus a random green I don’t remember the name of) in the bottles. We also used some Queen Anne’s Lace that I picked from a field fo’ free! Score! My friend arranged the flowers in the jug that sat on our table — I loved it! And that’s it! 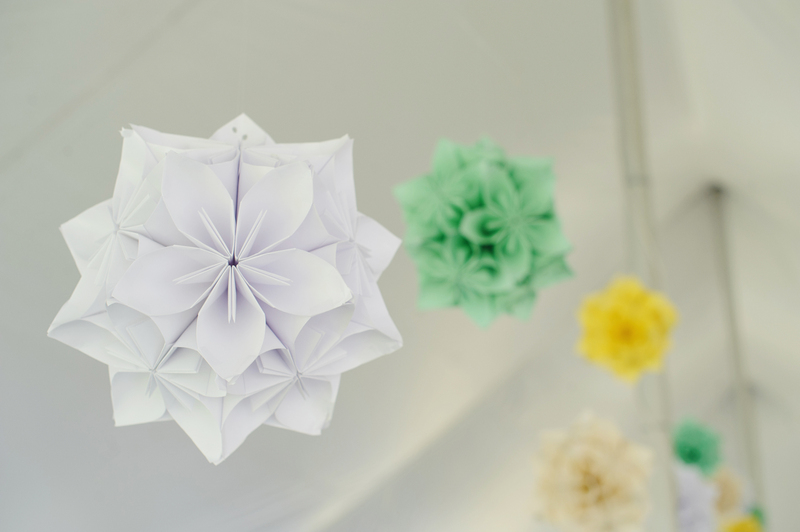 We kept the flowers pretty simple but less is more, right? I have been off the grid lately and it’s been great! Between Wednesday and Thursday of last week we got over a foot of snow so I had no school Thursday and Friday. I spent the whole time unplugged — just hanging out with the hubby and pups! It was great! I also did quite a bit of crafting for a Valentine’s Dinner I’m helping put on tonight (more details to come in a later post!) which was lots of fun. 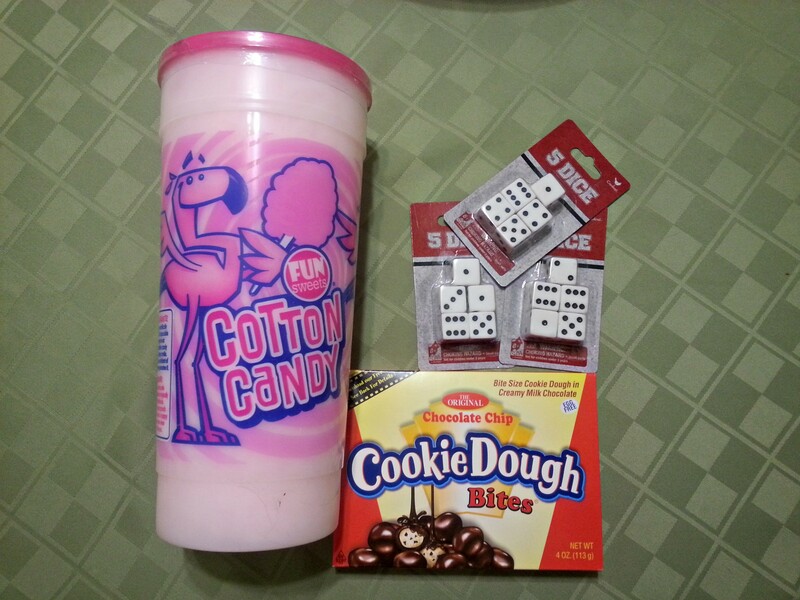 Justin and I tend to keep it fun and simple for Valentine’s Day. We don’t like to spend a lot of money so we always try to find something to do that is inexpensive and involves spending a lot of time together. Justin had volunteered at a local nursing home to help make Valentines with the residents and he made one for me (in addition to cutting out a ton of paper hearts). 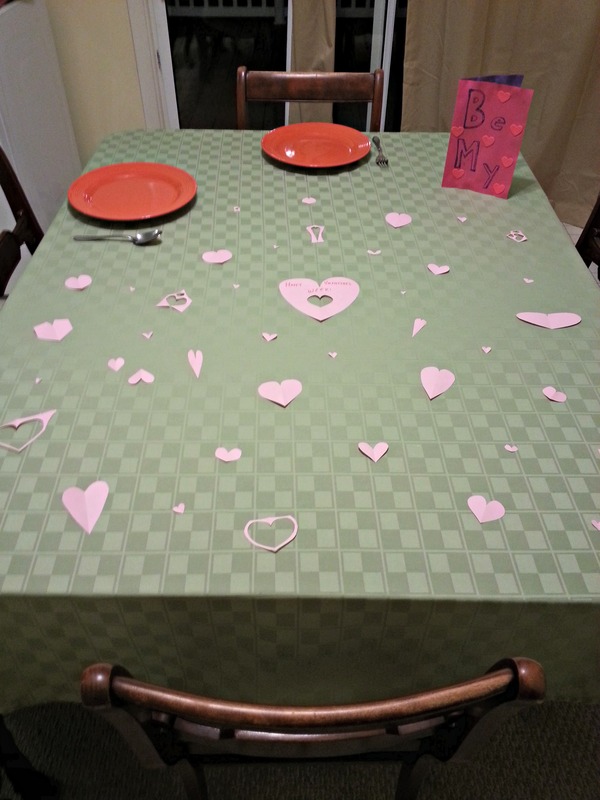 He also had the table all set and ready to go! I loved it! After Justin was finished with classes on Friday we took off on a road trip to Roanoke, VA to visit a college buddy of J’s. We spent the weekend hanging out at a local dog park (our friends have a puppy named Charlie and all the dogs got along SO well! ), checking out local restaurants, and exploring downtown Roanoke. My favorite part of our downtown exploration was a science museum called Center in the Square. There was quite a long wait for our lunch spot so we decided to kill some time by walking across the street and checking out the museum. We didn’t have time to see every exhibit (they had TONS) but we made the most of the time we had! We first checked out the seahorses. These creatures are so cool! 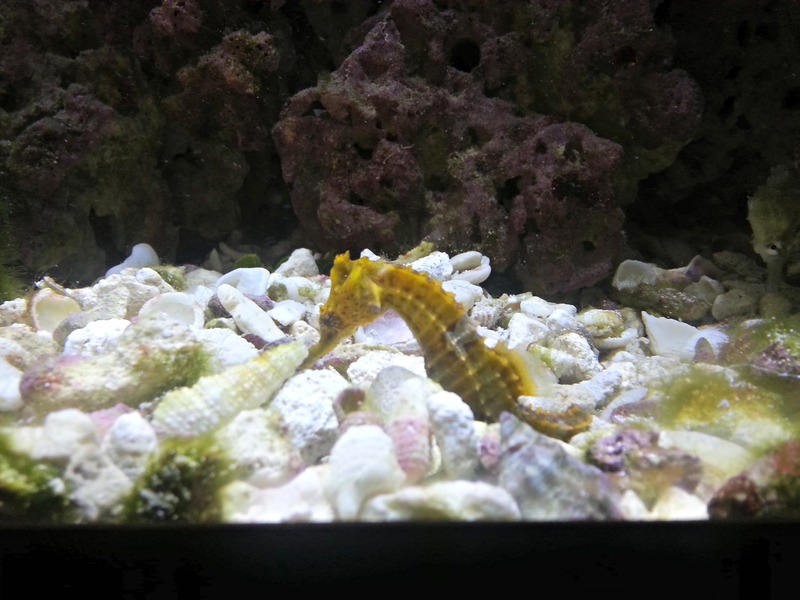 Seahorses have a difficult time navigating water and it was fun to watch them swim around! Next up were jellyfish. These are absolutely fascinating to see up close! 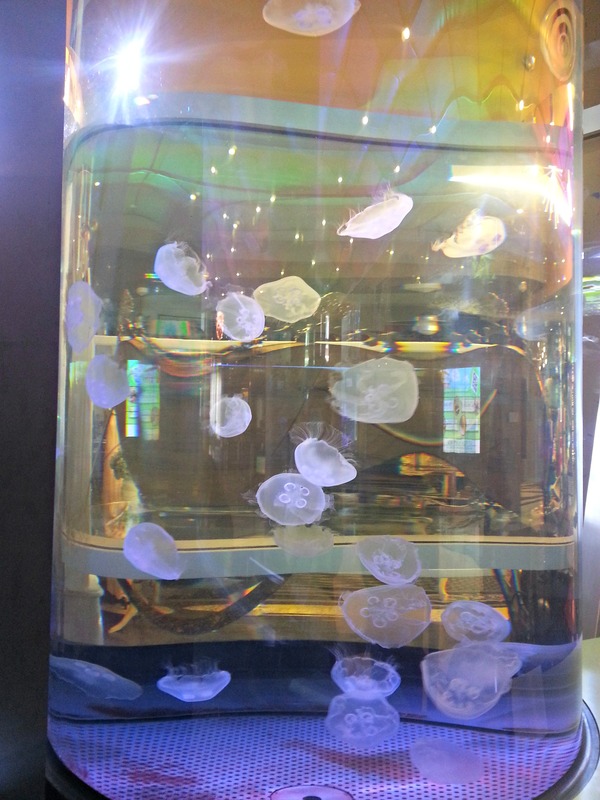 The tank had lights that changed color, which made the jellyfish change looks — super awesome! 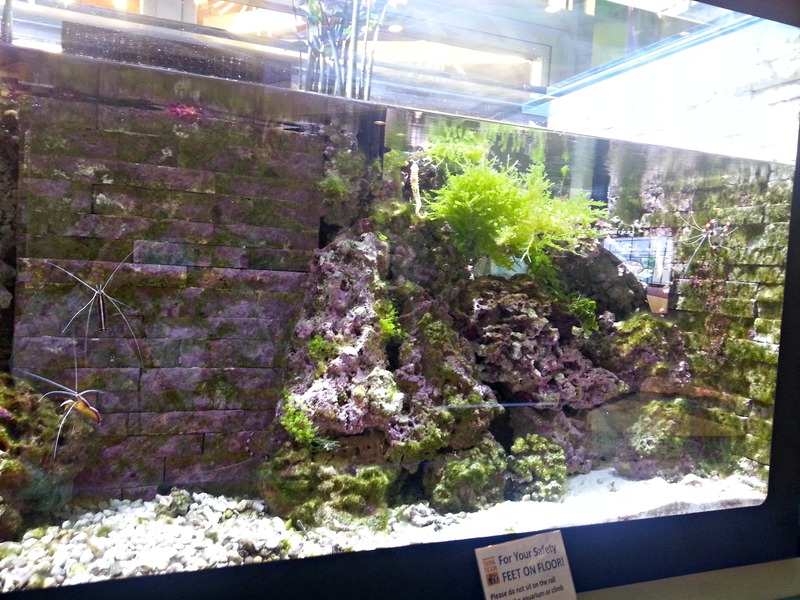 Possibly my favorite part of the aquarium was the giant fish tank. 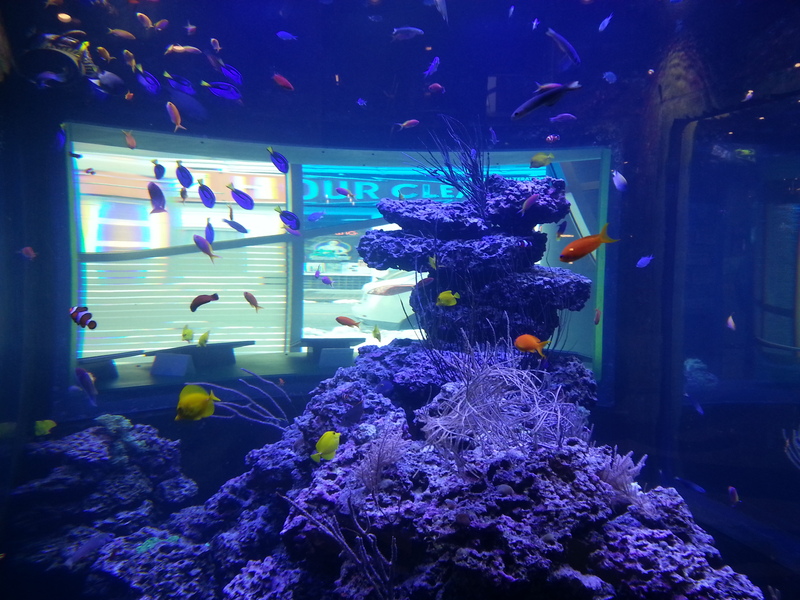 It had plenty of different fish, including “Dory” and “Nemo” (I just love that movie!) and was so beautiful. 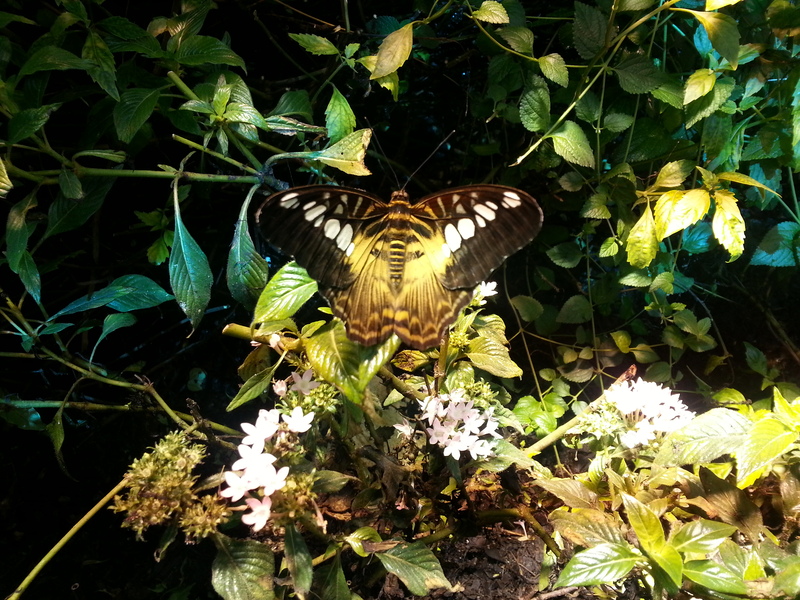 Next up, we bought admission tickets and went upstairs to the butterfly exhibit. 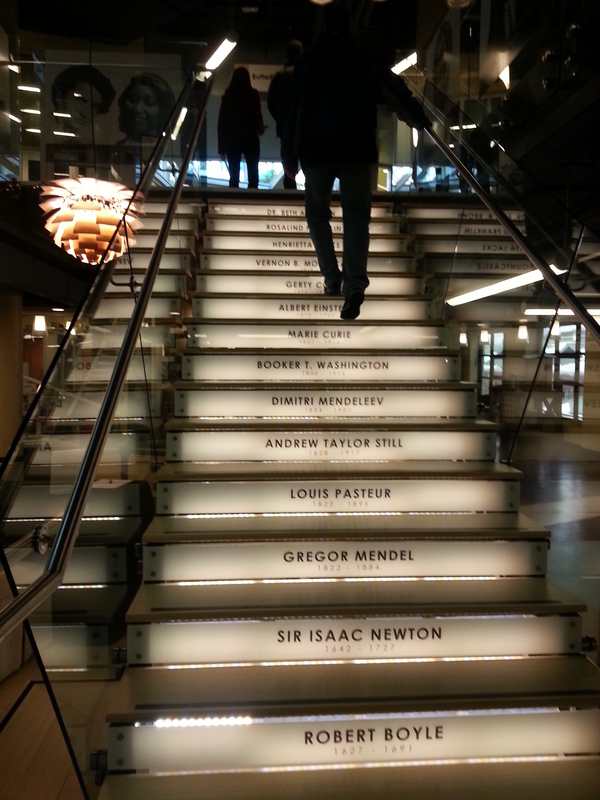 Check out this staircase leading upstairs! Sweet, huh? 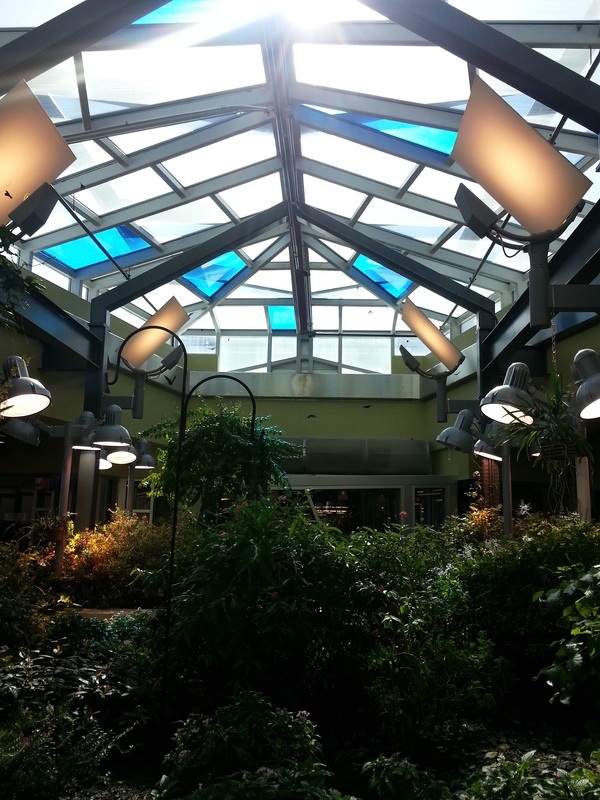 Walking into the butterfly garden was like walking into a tropical paradise. 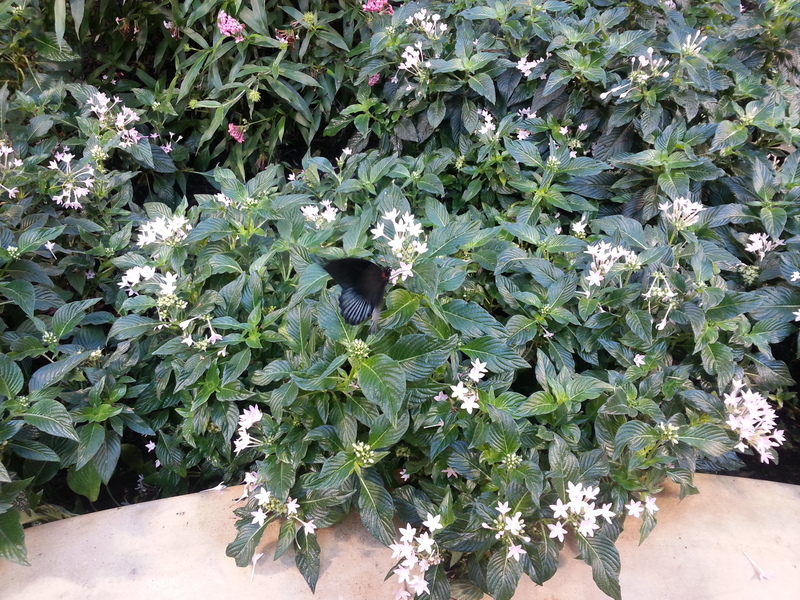 It was super warm and humid and I felt like I was in the middle of the rainforest. It was awesome! 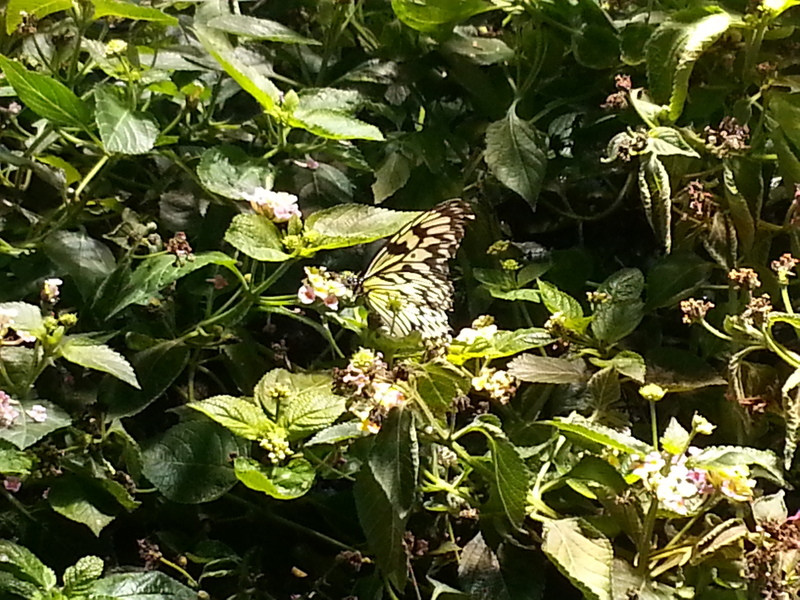 There were over 300 butterflies fluttering about in the garden and it was so amazing to see all the different types! So many colors! It was difficult to snap pictures of them but I got a few good ones. 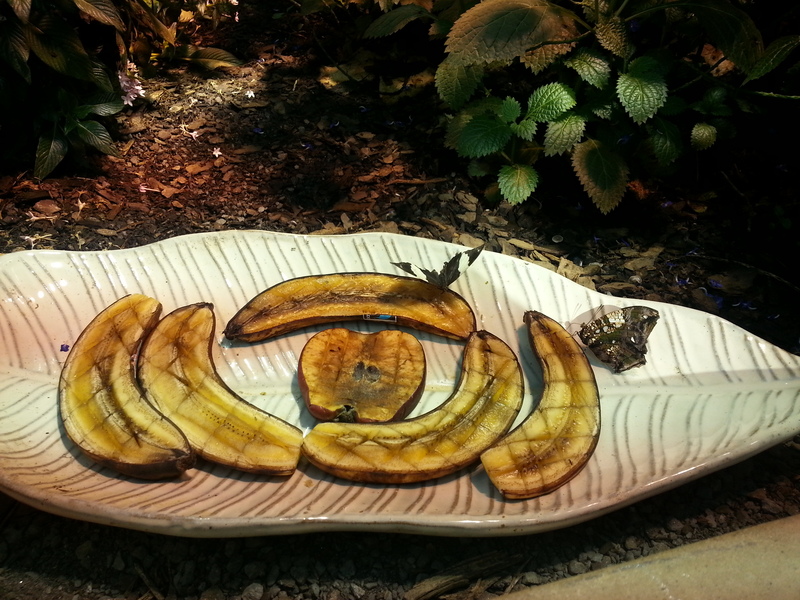 There were small plates of fruit around the garden for the butterflies to eat in addition to the nectar from all the flowers. The whole experience was super fun and I wish we would have had more time to explore the museum. Just peeking in at all the other exhibits showed me that the museum has a LOT more to offer! All in all, I would highly recommend checking Center in the Square out if you are ever in Roanoke! Shades of black and gray for today’s outfit! Links to available pieces on the wear page. Well, my streak of consecutive days at school over the past two weeks will stop at one, since we had no school again today due to icy roads. I am starting to get really stir crazy around the house! At least I am getting lots of snuggle time with my fur babies! 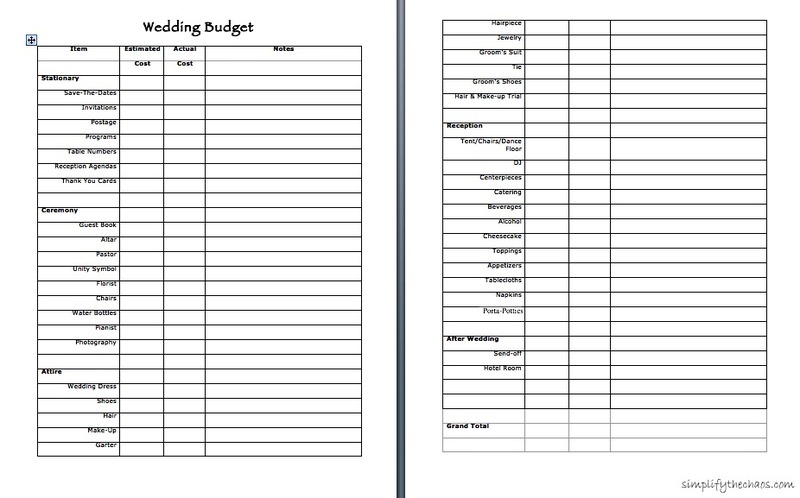 A few days after Justin and I got engaged, I created three different documents on my computer to help with organizing the planning process. Since I am still fairly new to blogging and so not tech-savvy, I was not able to figure out how to upload the actual documents I used to my blog. I originally wanted readers to be able to download each file for themselves if they found any of my documents to be useful; however, actually completing that was beyond my realm of knowledge. I therefore did the closest thing (within my capabilities) and took screen shots of my documents to upload as pictures. Lame, I know. But hopefully it still gives you an idea of how I set things up in case you’d like to set up something similar. The first document I created was our guest list. 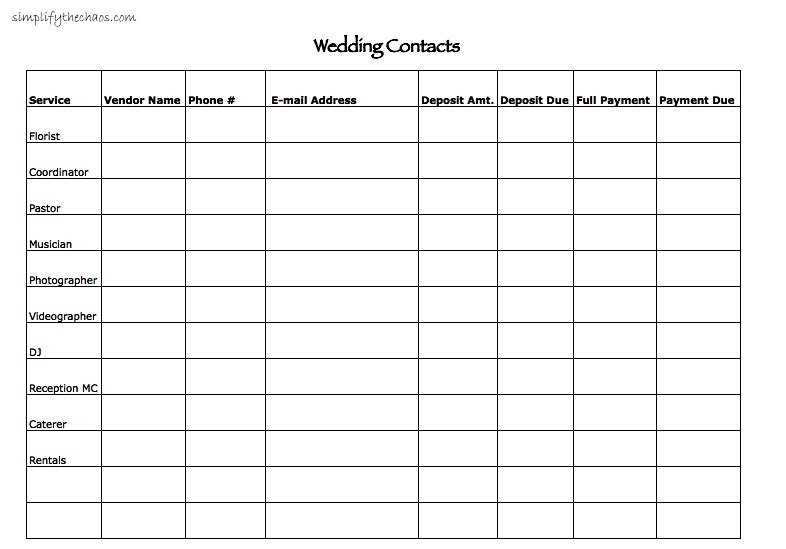 I actually downloaded my guest list straight from The Knot’s wedding planning website so rather than screen shot my guest list, I’ll just include the link to their list template here so you can download it if you wish. We actually signed up for a wedding website through weddingchannel.com (which is now The Knot) and were able to upload our guest list straight to the site. This made it SUPER easy to have guests RSVP through our wedding website and eliminated the need for RSVP cards. We got an e-mail notification when each guest RSVPed — SO NICE! I highly recommend going this route–it’s simple and f-r-e-e.
**Sidenote: The guest list is one of the hardest things to do. It seems easy enough, but when you have to combine you and your hubby’s friends, family, and all the random extras, it can get big fast. I suggest carving out a significant chunk of time to just sit down and list everyone you even might want to invite. (Justin and I did this on a seven-hour road trip shortly after we got engaged–I wanted to get it out of the way!) Then start to systematically work through and take people out. 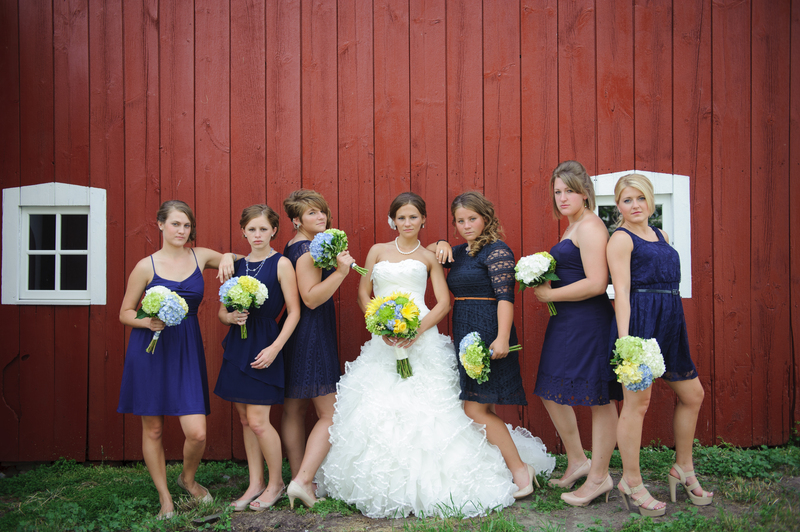 Don’t be afraid of hurting feelings; it’s your wedding!! And in reality, you simply can’t invite every single person in your life. With this one, I created a spreadsheet in Excel and listed every possible expense I could think of. I categorized the expenses into logical groups (i.e. stationary, reception) and listed all the details underneath. I had an “estimated cost” column to list how much money we were going to budget for each item and then I also had an “actual cost” column to list how much the item actually cost. I set up the spreadsheet to have a “Grand Total” at the bottom and inserted a formula for the box to automatically update and add up the total in each column so I could easily see if I was under/over budget. This made it SUPER easy to keep track of our money and also helped me see where we could try to cut costs. I cannot stress this enough. A master contact list is an absolute must. It is hard to keep track of everyone’s numbers and information and you will want to be able to stay in touch with your vendors in case you have questions or need to confirm details with them. My master list was super simple. Just an Excel sheet with all the vendors and their essential contact information listed, and also columns to keep track of payments. 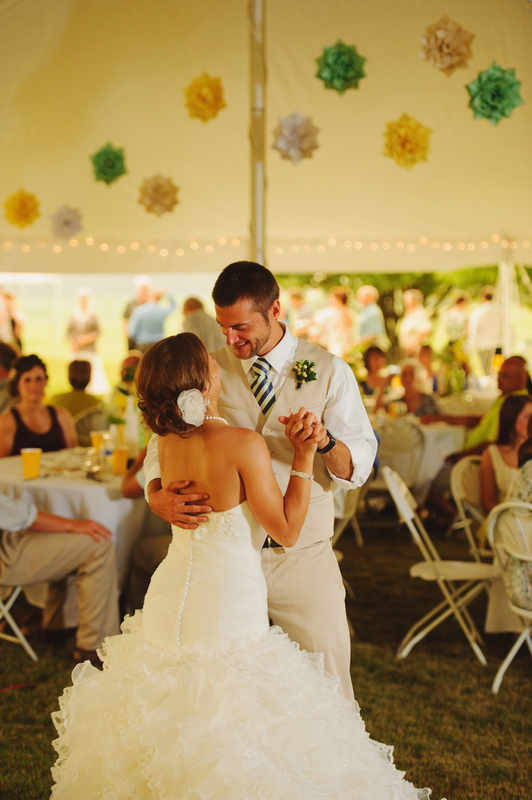 Some vendors require deposits, others want an additional portion of the payment before the wedding. It’s easy to lose track of who you have paid already and when payments are needed so this is a simple way to keep all the information in one place! 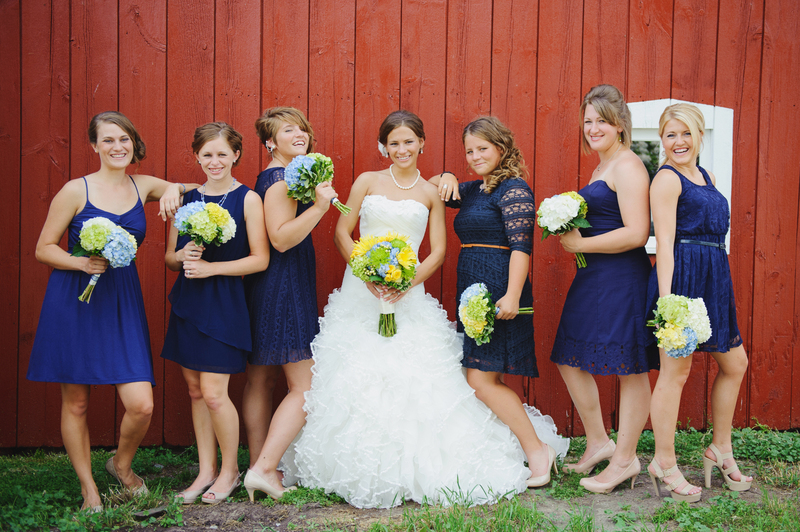 Another helpful document to have at the beginning of your planning is a wedding timeline. My sister-in-law gave me a copy of Real Simple’s wedding planner and I used the timeline they had but you can find many online. This was a very helpful tool to keep me on track and help me to know when to do things. Had I not had this, I would probably have had way too many things to do close to the wedding and it would have been stressful. I’m so glad I spaced everything out and had some time to breathe! No school, no outfit of the day. Even if there’s no school tomorrow, I need to put on some real clothes!! 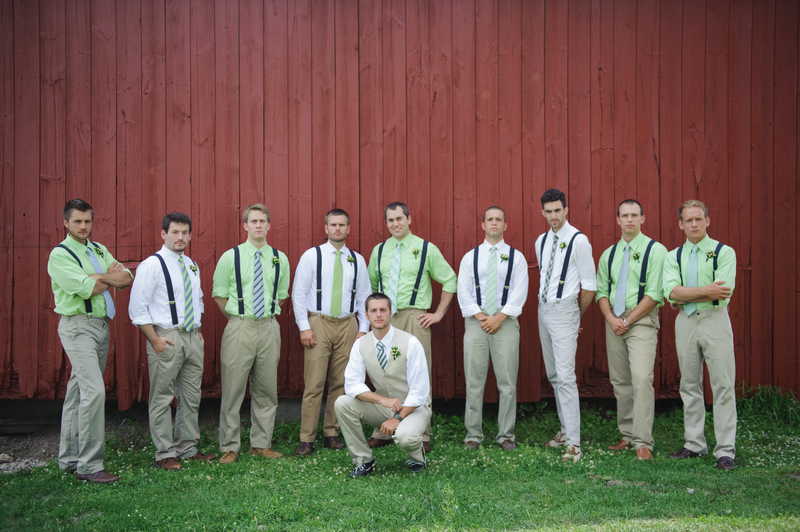 Author SarahPosted on January 29, 2014 Format ImageCategories Love, Uncategorized, WeddingTags organization, wedding, wedding budget, wedding contact list, wedding guest list, wedding planningLeave a comment on Wedding Wednesday: Begin Planning! Today I want to share something that I came up with last year and used on a daily basis. 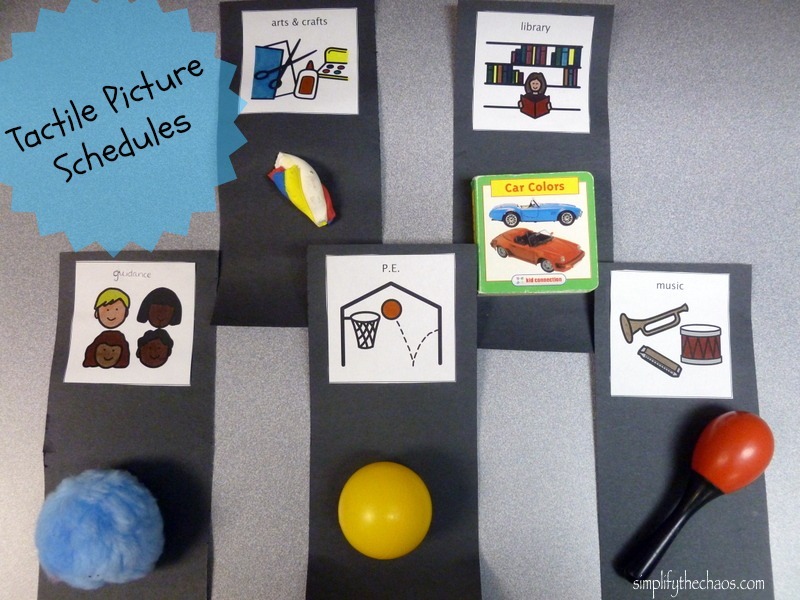 At the time, I was teaching students with multiple disabilities, and all of my students had sensory processing needs. On top of that, nearly all of them had visual needs and limited fine motor skills. 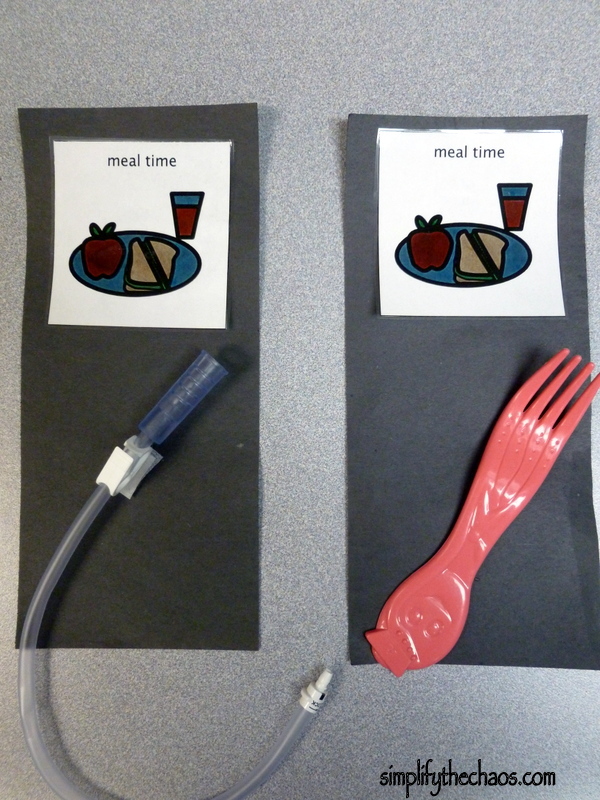 For “meal time,” I attached a real plastic fork identical to the ones the students ate with. For my students who used a feeding tube for meals, I used an extra feeding tube in place of the fork to make it applicable to them. 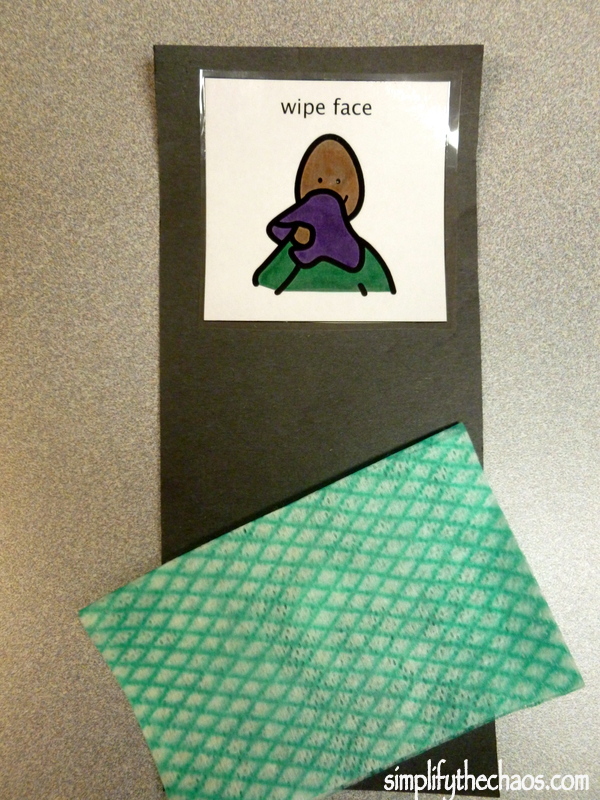 For “wipe face,” I attached a piece of a real wipe identical to the ones we use after meals. 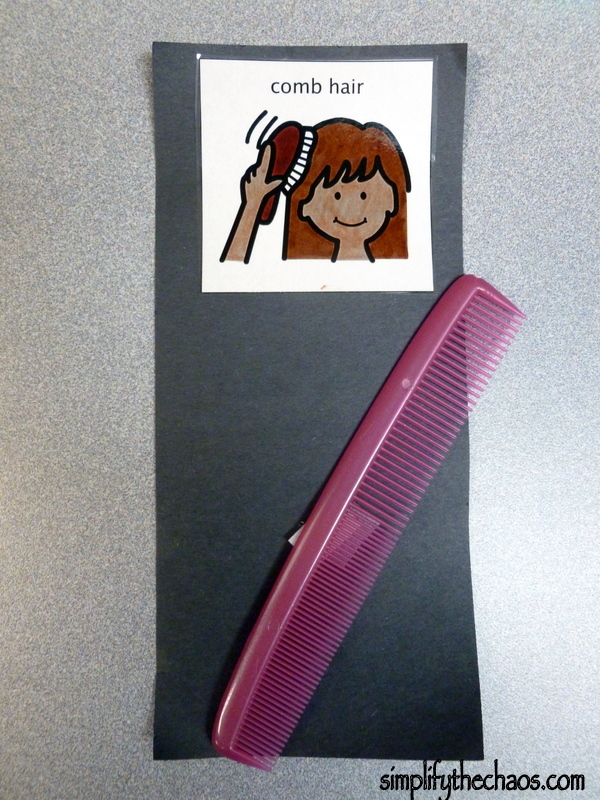 For “brush teeth,” I attached a dollar store tiny toothbrush, and for “comb hair,” I attached a dollar store comb. 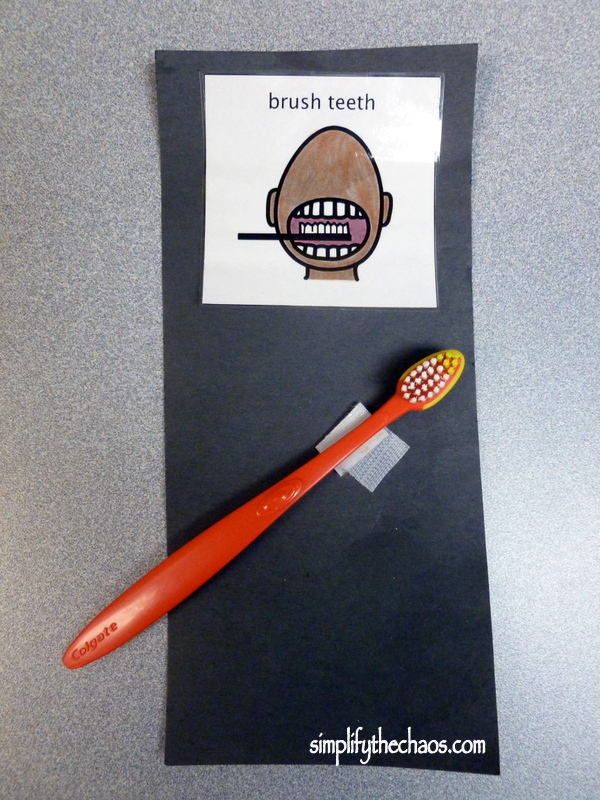 As we went through our morning routine, we would show the students the picture and object for each task. The students had a chance to touch and feel each object. When we started a task, the picture went into the white basket. When we finished a task, the picture went into the green basket. 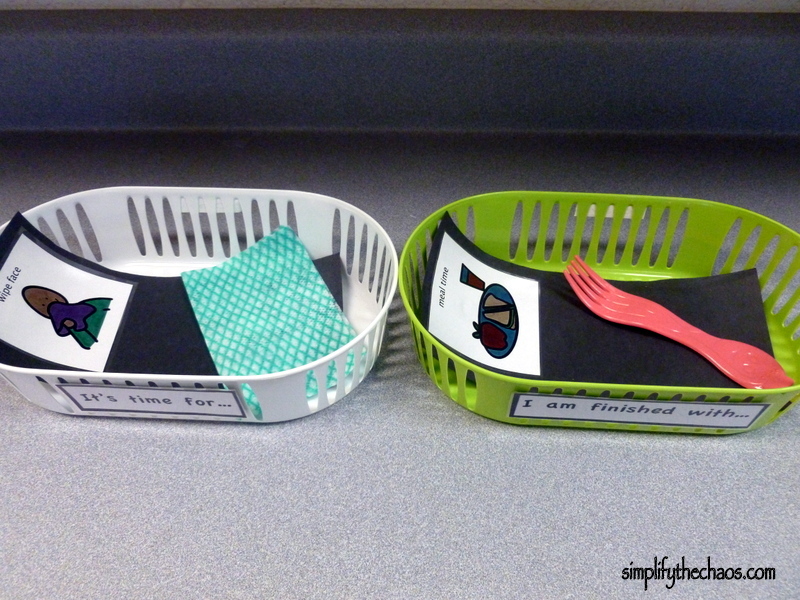 Some students were able to move the picture from one basket to the other independently. I think this provided a great transition visual! 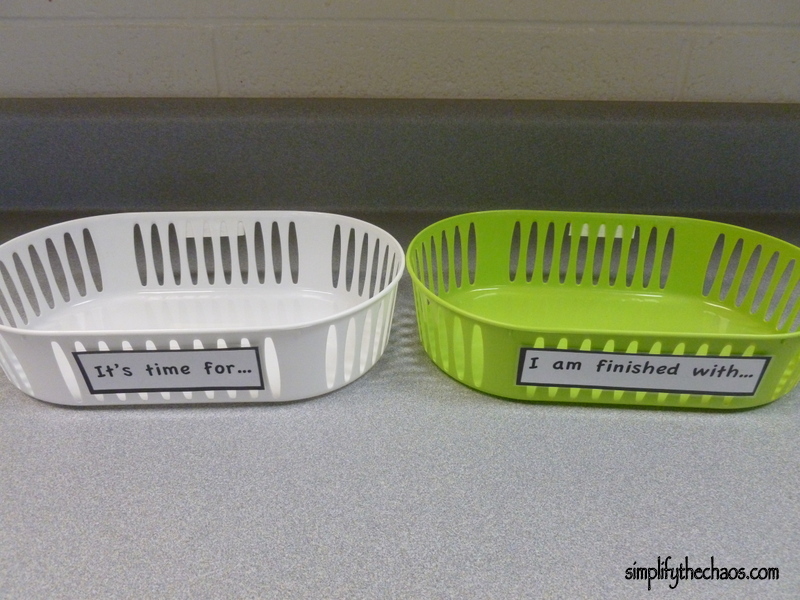 As tasks finished, we allowed the students to stack the tasks in the green basket so they could see how much we had already done. 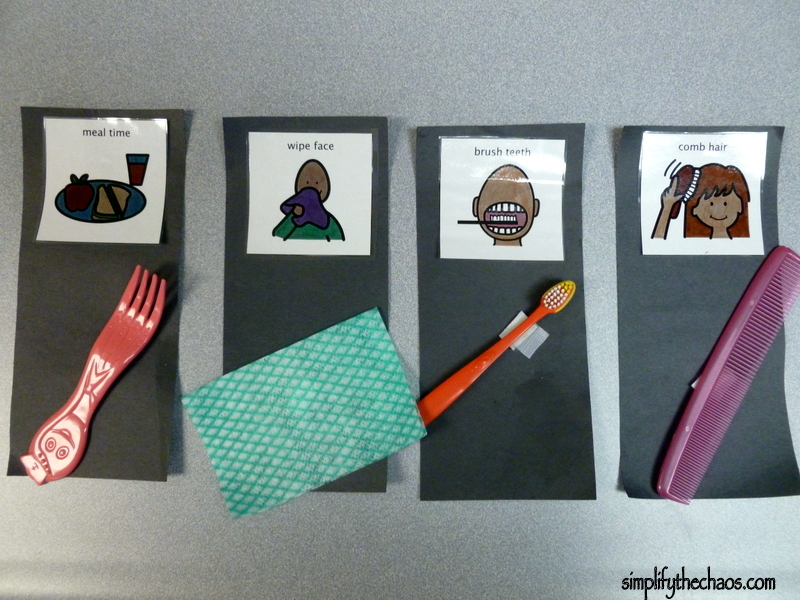 I also created strips for our daily “specials” classes. This one was a little more difficult to come up with concrete objects for, but I’m very pleased with the results! 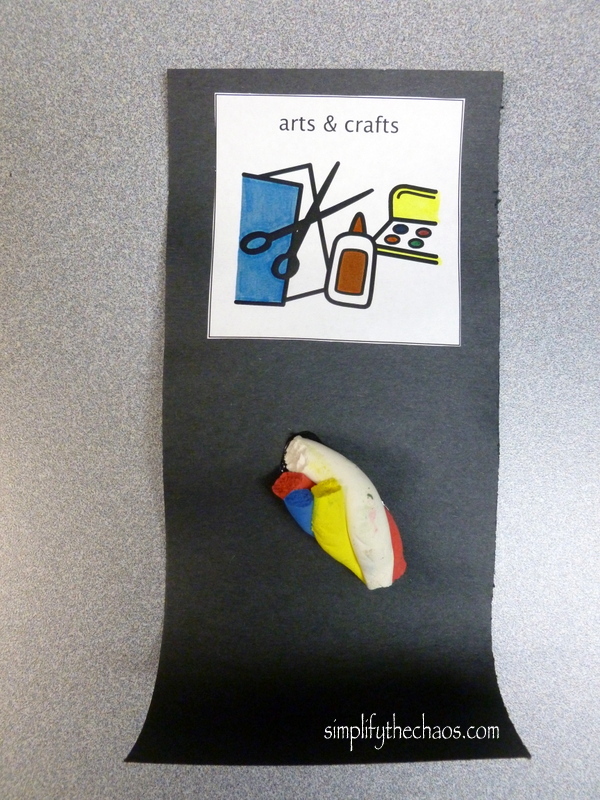 For “arts and crafts,” I used pieces of Model Magic, which my students frequently use in art class. 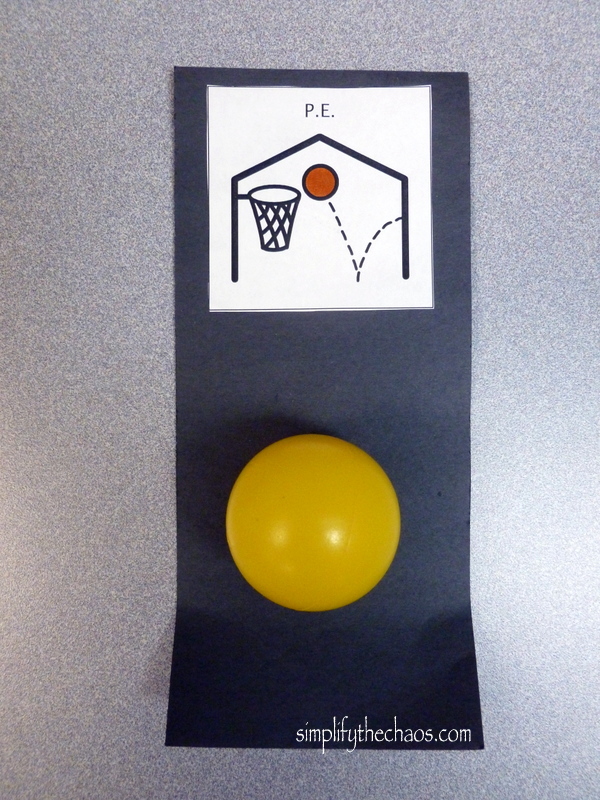 For “P.E.” class, I used a small plastic ball identical to the ones they sometimes use in the gym. 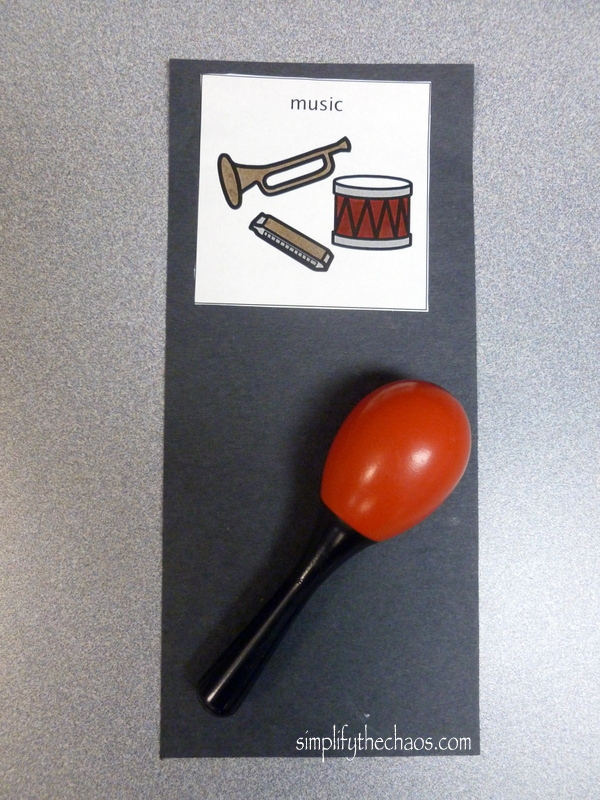 For “music” class, the music teacher did me a HUGE favor and lent me some small instruments (small maracas and bells) that he didn’t use anymore. I Velcroed these on so we could still pull them off and use them for musical activities in class. 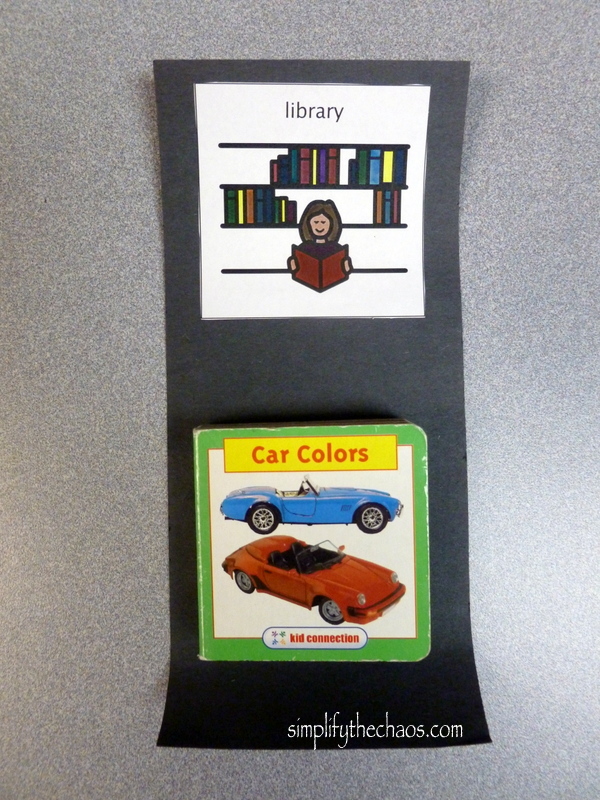 For “library”, I found tiny board books (at a thrift store for cheap! Whoohoo!) and attached them to the strip. I should mention that I did a picture strip of everything for EACH student. I had six library strips, six music strips, etc. It was exactly what I wanted: a simple way to keep my students actively engaged and allow them to access the schedule and understand what was going on in their surroundings. 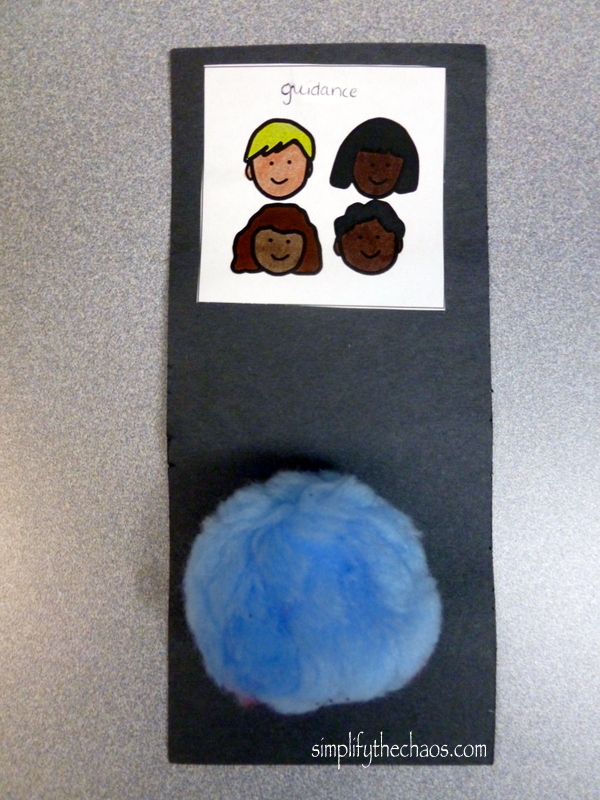 It was also a great visual way to teach transitions. You could do this for an infinite number of school activities (recess, calendar time, subjects like math, science, etc. The list goes on and on!) It takes some work but it is worth it in the end! 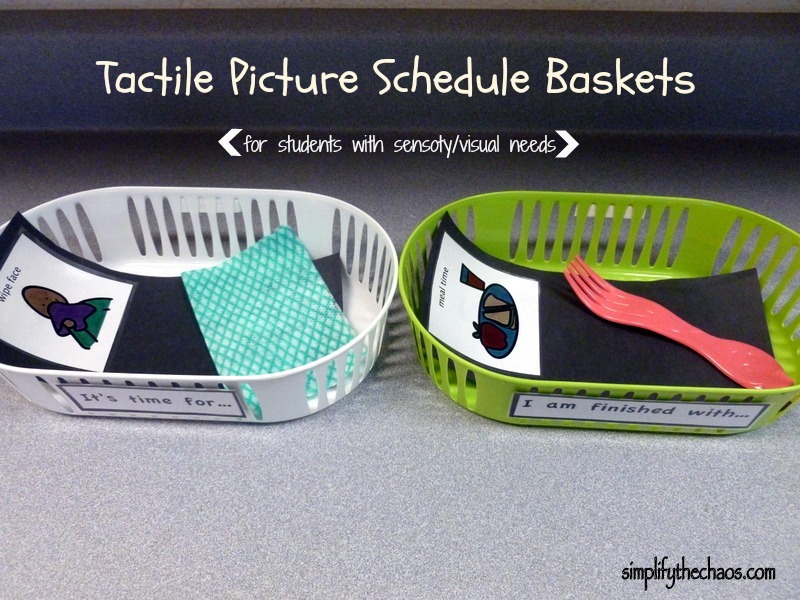 Author SarahPosted on December 3, 2013 Categories simplify the chaos, Special Education, Uncategorized, Work OutfitsTags access curriculum, daily outfit, elementary picture schedule, fine motor skills, picture schedule, sensory processing, special education, tactile schedule, visual needs, visual schedule1 Comment on Teacher Tuesday: Picture Schedules!